In 2017 the strong depiction of place in many of the books I was reading reminded me that at every step in the writing process the author must be conscious of the need to incorporate detail that brings the city streets, the countryside, the interior of rooms where his characters spend their time, vividly to life. In any piece of fiction, the author’s pledge to the reader is to provide a sensory experience. The need to precisely evoke the sights, sounds and smells that will make the setting, and thus the story, convincing and memorable, must never be far from the surface of the author’s mind. Setting grounds the action in time and space. It will be obvious, of course, that setting is crucial to fiction, on an equal footing with character and incident. Stories have to take place somewhere, and the reader must be able to inhabit that somewhere, wherever it is. Unlike some aspects of writing fiction that are more or less intuitive, the choice of setting for a story is normally made on a conscious level. Lots of writers make use of the world where they live their own lives. They locate their characters among the people, landmarks and objects they encounter when they step outside their front door. Some writers invent settings using details from places they've visited or read about. Others conjure up fanciful locations that exist only in the imagination. Any approach is valid, so long as the author finds a way to make it real for the reader. The writer who sets his story on the street where he lives is being anything but lazy. The challenge remains to make the setting live and breathe. But there is an added challenge: to get everything right so that readers who live on the same street are not being jolted out of the story by details that don't match what they know to be true. One last random thought: writers are well aware that not all potential readers share their experience. Not everyone who picks up a book is familiar with the community or city or country where the author lives. Unlike authors, books have the ability to wander the world unencumbered. Readers live everywhere. My boring little town might seem strange and exotic to someone living on the other side of the world. The books on my 2017 list are notable for many reasons, but in each case the real or imagined place where the action unfolds makes an essential contribution to the experience that the story brings to the reader. The Confessions of Josef Baisz is presented as the posthumous memoir of one Josef Baisz, a minor official in the government of the fictional Republic of Sarmeda. The geographical specifics of Sarmeda are not provided, but the country has a North and a South. Baisz hails from the rural, backward North and, when he joins the Republican Guard, is relieved to escape his home town of Vliss and a family with a checkered past of which he is ashamed. While suffering through basic training in the company of bullies and dolts, he makes a lightning-quick decision that marks him as a hero. It is also a deliberate act of petty revenge that ruins the life of an ignorant and guileless fellow cadet, but this outcome troubles Baisz not at all. As a result of his quick thinking, Baisz is recruited to serve as personal bodyguard for the Deputy Minister of National Guidance, and the course of his career is set. Over the years, Baisz serves many masters, all of whom trust him implicitly, all of whom he holds in contempt and betrays in a variety of ways. It is by means of these betrayals and a combination of luck, cagey opportunism, and heartless scheming that he is able to steer his career in a mostly upward direction. By serving those in positions of power, the wily and observant Baisz finds himself uniquely situated to witness the rampant corruption and capricious brutalities of a totalitarian state that keeps its citizens subservient to an inflexible ideology and in thrall to the politically resilient Heerser, the Sarmedian see-all, know-all supreme leader. But when the ultimate reckoning comes in response to a betrayal more contemptible than any he has previously committed, one that even he can’t justify or condone, Baisz finds himself stricken by an unaccustomed fit of conscience and retreats from public life to compose his tattle-tale autobiography. Dan Jacobson’s novel is a triumph: an expert blending of style with substance. In Josef Baisz, Jacobson has created a loathsome and dangerous amoral creature: a man with no qualms about destroying others in order to gain an advantage or achieve advancement, but who also, like an insect or parasite, has no sense of purpose. Throughout the book, Baisz speaks to us in the confident and sardonic voice of someone who knows that his conduct is repugnant, that he lacks redeeming qualities, that he is undeserving of the success that comes his way, but doesn’t care because ruthlessness and sheer cunning will ensure his survival. What is unexpected is how funny the novel often is, as Baisz comments on the shortcomings of his superiors and informs us in gleeful fashion what he’s up to behind their backs. The Confessions of Josef Baisz is a wry commentary on human civilization in the late 20th century, with specific reference to the type of person who is likely to flourish in a society built on absolute control and the suppression of individual will. It is also an enormously entertaining and supremely intelligent work of fiction by an unjustly neglected author who, when it was published in 1977, was clearly at the top of his game. Madeleine Thien's multi-prize-winning novel is a sweeping journey through several decades of eventful and tragic Chinese history. The complex story, which weaves together various narrative threads, begins in Canada in 1989, with young Marie learning that her father, 39 years old and a concert pianist, has killed himself while living in Hong Kong. 1989 is of course a watershed year in Chinese history and politics because of the uprisings and protests that were tolerated for months before being brutally suppressed by the government, with the loss of hundreds and perhaps thousands of lives. The next year, in December 1990, 19-year-old Ai-ming, a relative fleeing the clampdown, arrives in Canada to live with Marie and her mother. Marie and Ai-ming form a close bond, but Ai-ming subsequently leaves Canada for the US; Marie loses touch with her and spends the remainder of the book trying to track Ai-ming's movements over the years. Much of the novel is a vivid and often heartbreaking account of the lives and hardships endured by an earlier generation of Marie's family who lived their entire lives in China, starting in the late 1950s and ending with the violence of June 1989, a 30-year swath that includes the Cultural Revolution, the death of Mao, the rise of Deng Xiaoping and the trial of the Gang of Four. For many of us in the West, the story of Communist China is a daunting and impenetrable tale of repression and brutality. Our knowledge is riddled with gaps and our comprehension rudimentary at best. Maybe we know a few names and phrases, but the pieces don't necessarily coalesce into a coherent rendition built on cause and effect. Thien deploys considerable narrative skill and a highly developed sense of drama to help us attain a more solid understanding of what took place during those years by relating the story of a group of people whose talents and ambitions centre on music, and who suffer severe and sometimes fatal trauma from the immediate and lasting effects of government policies imposed by a rigid and unfeeling totalitarian regime that treats its citizens like pawns on a chessboard whose lives are not their own to live. The narrative is sometimes disorienting, with its frequent shifts of setting and period and a sizable cast of characters. But the cumulative effect of the suffering depicted in these pages is emotionally devastating and memorable. 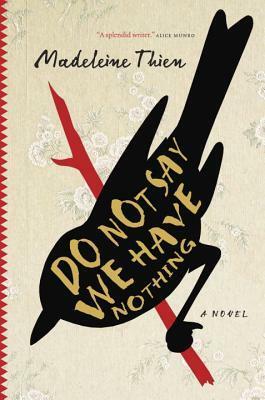 With Do Not Say We Have Nothing, Madeleine Thien vaults into the front ranks of Canadian novelists, serving notice as well that she is writing sophisticated fiction for an international audience. In Jean McNeil’s suspenseful novel, Rebecca Laurelson is a doctor on temporary leave after an attack on the NGO field hospital where she’s been treating the wounded. The hospital is in an isolated region of East-Africa where Islamic extremism is spreading and surrounding towns and villages are coming under threat. After leaving her post, she travels south to Kilindoni, on the Indian Ocean, a luxurious resort town where prosperous white Africans flaunt their wealth and carry on as if the dangers that threaten their way of life don’t exist. Rebecca’s Aunt Julia and Uncle Bill, eminent members of this set, live in the Dhow House, a roomy, well-appointed, well-guarded seaside retreat, lushly landscaped and situated behind gates. Rebecca was raised in England by her mother, Julia’s sister, and recalls seeing her aunt on only a single occasion when she was very young (as the novel begins Rebecca is in her late thirties). She also remembers that her mother’s family disapproved of Julia’s life choices. But even though Rebecca is a virtual stranger to her aunt and uncle and their two adult children, Lucy and the enigmatic Storm, they welcome her into their home and treat her as if they’ve known her all her life. Rebecca, however, traumatized by her recent brush with death and in a vulnerable state, is holding back. She can’t tell anyone what is really going on, a situation that only adds to her feelings of isolation and loneliness. Putting on a brave face, she fits in as well as she can and drifts through her weeks in Kilindoni, observing events and interactions that take place around her, attending parties and leisurely lunches, going to the beach, drinking wine, and getting acquainted with her extended family. Still, she can’t escape what she knows and can never truly relax. To make her situation even more precarious, she finds herself unable to resist an overwhelming physical attraction that shames her and that she knows is a betrayal. As the extremists move south and the violence creeps closer to the country’s urban centres, and the dangers that Rebecca knew all along were closing in on all of them finally take a lethal toll, her betrayal is discovered and she is forced to accept that there is no remedy for what she has done. Jean McNeil is a disciplined and patient writer. This is a novel that gains its considerable power from the author’s expert withholding and her subtle deployment of numerous moral ambiguities. In McNeil’s novels families are never simple and emotions are often as destructive as any roadside IED, and this is especially true of The Dhow House. Our fascination with Rebecca is driven in part by her damaged state of mind and the burden of emotional baggage she carries with her, which render her suspicious and unreliable. We often question what she does, but even her most brazenly self-destructive actions are dramatically appropriate and convincing. To be sure, The Dhow House is a novel that challenges the reader. Its structure is not linear. The story unfolds slowly. McNeil relies on flashbacks to fill in the blanks in Rebecca’s recent past. But the book is written with a sensual appreciation for the power of language to move the heart and stimulate the intellect. The frequent descriptions of the natural world dazzle with the precision of first-hand observation (the author is also an accomplished travel writer and memoirist). Jean McNeil’s is a mature talent, and The Dhow House is fully engaging at every level. It takes us into a world filled with menace and populated by people whose motives are often hazy, but it is a novel that we inhabit and from which we emerge with reluctance. The unnamed narrator of Garth Greenwell’s remarkable first novel is an American living in Sofia, Bulgaria, who in the first section meets a street hustler named Mitko in the public washroom of the National Palace of Culture. The narrator—still relatively young—is gay and makes no secret of it. In fact, full disclosure is his credo, and we later learn that people at the university where he teaches are aware of his orientation and not concerned. The encounter in the washroom marks the beginning of a relationship that, in brief sporadic bursts, extends over several years. At first, the narrator is obsessed with Mitko, charmed as much by his youthful vigor and risky lifestyle as by his supple body and sexual proficiency. The narrator is also someone who learned who he was early in life, learned to accept his identity and everything it implied, even if his family did not. Much of the novel is given over to flashbacks or recollections, triggered when the narrator learns that back home in America his father is dying and wants to see him. The wound that this event opens is deep and, as we see, only in the early stages of healing. The narrator’s fascination with Mitko persists even after he learns that he’s been infected with syphilis, persists even after he consciously rejects the clichéd promiscuity that Mitko represents and settles into a monogamous relationship. He knows he has to cut him off, but what he cannot bear is Mitko’s loneliness, which is manifest in their every encounter and which again and again he takes it upon himself to assuage, even with Mitko treating his wallet like a personal bank account and occasionally even threatening physical harm. These aspects of Mitko simply feed the fascination. Greenwell’s novel is psychologically rich, uninhibited and dramatically intense. Densely written, every page crammed with evocative detail, the reflections on modern life offered up by its observant and acutely self-aware narrator are affecting, disturbing and thought-provoking. A supremely intelligent and lucid work of fiction that is also emotionally truthful, What Belongs to You will reward the adventurous reader looking for a new and genuinely original voice. The Guilty One is an unconventional crime novel that takes its inspiration from the chilling modern phenomenon of violent crimes committed by children against other children. Daniel Hunter is a successful London lawyer in mid-career with a reputation for working with young offenders. When he is approached to take on the case of 11-year-old Sebastian Croll, he does not hesitate to accept. Sebastian is accused of the chaotic and bloody murder of 8-year-old Ben Stokes, whose body was discovered in a playground. Because he grew up in an unstable household—with an unreliable, drug-addicted mother whose boyfriends often beat him—and subsequently committed a variety of offences himself, Daniel is sensitive to Sebastian’s plight. Daniel knows he was lucky, even though he was removed from his home and placed in foster care. Daniel’s anger and often violent behaviour marked him as a hard case, and as a last resort he ended up with Minnie Flynn, an older woman living on a run-down farm in Brampton. Having grown up in the city of Newcastle, Daniel initially found Minnie’s hand to mouth existence and simple ways foolish and odd. Distrustful of all adults, he lashed out and repeatedly ran away, in search of his mother. However, Minnie was patient with him and refused to be intimidated. She let Daniel know that she understood his fear but that she also had expectations. Eventually, Daniel accepted his new situation and settled into life on the farm, even agreeing to let Minnie formally adopt him. Flash forward 25 or so years. Daniel knows what it is like to be small, helpless, and forced into a place where he doesn’t feel he belongs. He knows what it’s like to be so angry that hurting other people seems to make sense. His heart goes out to Sebastian Croll, but does empathy cloud his judgment? The case against Sebastian moves forward. The prosecution produces an eye-witness who saw the boys together on the afternoon of the murder, and others from Sebastian’s school and the neighbourhood where the crime took place who characterize Sebastian as a bully incapable of friendship. Though Daniel sometimes finds Sebastian unsettling and regards the boy’s interest in things related to death and blood unnatural, he tries not to let it distract him from his job. Moreover, Daniel can see that Sebastian has been affected by a less than ideal home life, with a self-medicating mother and a pushy, short-tempered father. Lisa Ballantyne’s novel proceeds along dual narrative lines: one thread following the case and Daniel’s defense strategy, the other showing us Daniel’s difficult childhood. The Guilty One is a smartly constructed novel that doles out clues in a deliberate manner, drawing the reader through its layered and complex plot toward a satisfying conclusion. In Daniel Hunter, Ballantyne has created an attractive and engaging protagonist, a young man riddled with self-doubt and regret, but also intelligent and self-aware. In this largely successful and highly entertaining debut novel, Lisa Ballantyne has written a dark and suspenseful legal procedural with a deeply affecting human dimension. Gaute Heivoll’s enormously satisfying novel/memoir, Before I Burn, recounts a period from the spring of 1978, when the people of Finsland--a remote, sparsely populated region in southern Norway--were terrorized by a series of deliberately set fires that destroyed homes and ruined lives. Heivoll’s cast of characters is made up of the people who were resident there at the time, a list that includes his own parents and, eventually, himself since he is born in the midst of the crisis. The book is billed as a crime novel, and though crimes are committed in its pages and police arrive to investigate, the prose has an undeniable literary polish and the story’s unconventional structure constantly chafes against the restraints of the genre. The action follows three distinct threads. In Finsland in 1978 fires are being set and no one can figure out who is responsible. At the centre of this is Dag, a smart, talented and deeply troubled young man and son of the local fire chief. In 1998 the twenty-year-old Gaute Heivoll, watching his father slowly succumb to cancer and profoundly dissatisfied with the routine path his life seems to be following, deliberately sabotages his law exams. And in the contemporary thread, Gaute, now a writer in his thirties, has returned home to Finsland with the intention of conducting first-hand research into the circumstances surrounding the fires while some of the people who experienced the fear and panic of those weeks in 1978 are still alive. Psychologically penetrating and chillingly evocative of what it must be like to feel threatened and helpless in your own home and suffer emotional turmoil at the hands of a force that is unpredictable and lacks both a face and a shape, Before I Burn grips the reader from the first scene and doesn’t let go until the unsettling epilogue.